Some old friends invited us over to their place for a Chanukah party. 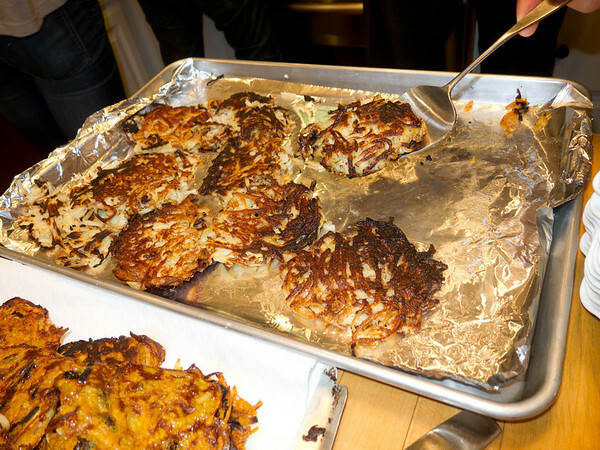 Now, as many of you may know, the traditional food for this occasion is potato latkes. These are basically shredded potato and onion deep fried. Like any fried thing, if fresh, they can be tasty. Now bear in mind that I didn’t do any of the excellent cooking depicted below. The hostess of this party has always been an amazing cook, and this was a collaborative effort between many members of her family. I brought the wine. 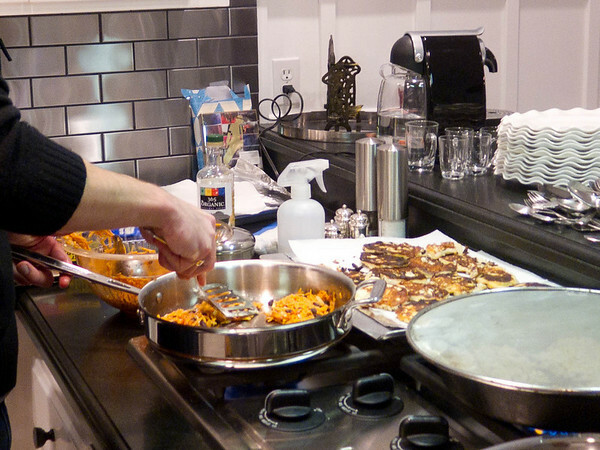 Four different kinds of latkes were made (details below). 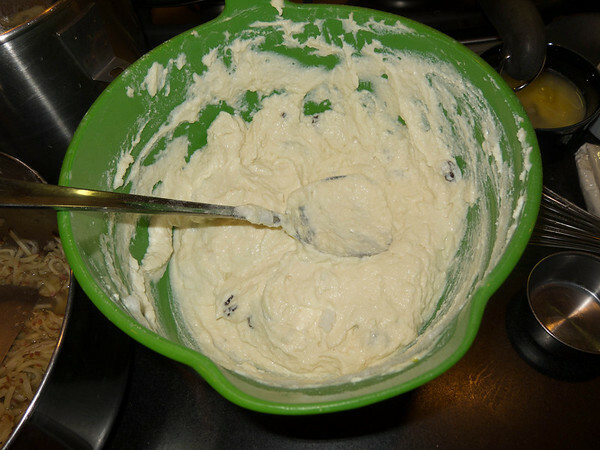 This is the batter from the cheesy one. My one cooking contribution was to fold in the whipped egg whites. This is basically blintz filling. Some frying. Latkes are usually pan fried. Classic potato, but made totally from scratch. 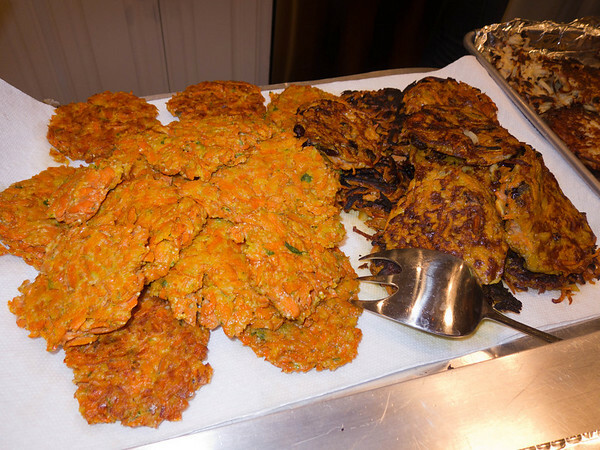 On the left are the carrot latkes, and the right sweet potato. Personally, I thought both superior to the classic, but i’m not a huge potato fan. These were both awesome. Some of the sweet potato ones had nuts in them, which i liked. 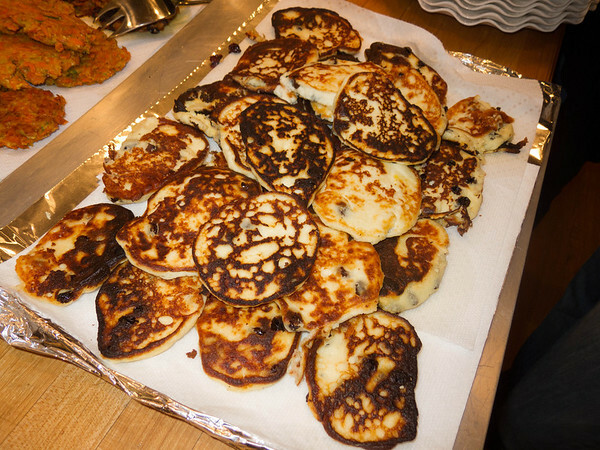 The cheese latkes, made with the batter shown above. Raisons were mixed in. These were delectable, tasting like blintz filling, with a nice light fully ricotta flavor. Personally, I found them to be a bit reminiscent of a recipe from Apicius where the Romans mixed ricotta, herbs, lightly fried it, and drizzled it in honey. Top shelf condiments. 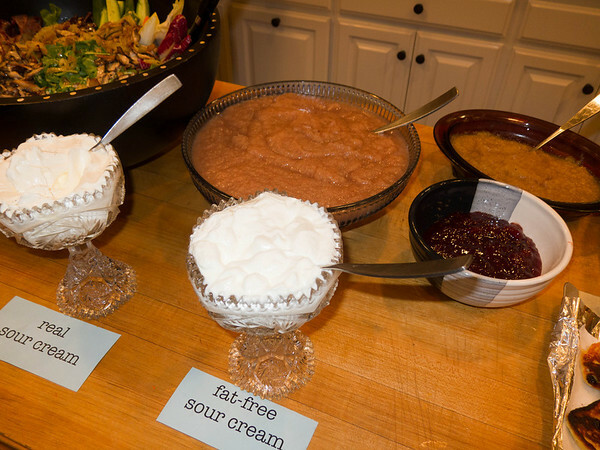 Two sorts of sour cream, two hand made apple sauces (from two apple types) and strawberry jam. Latkes go well with sweetness, cuts the fat. 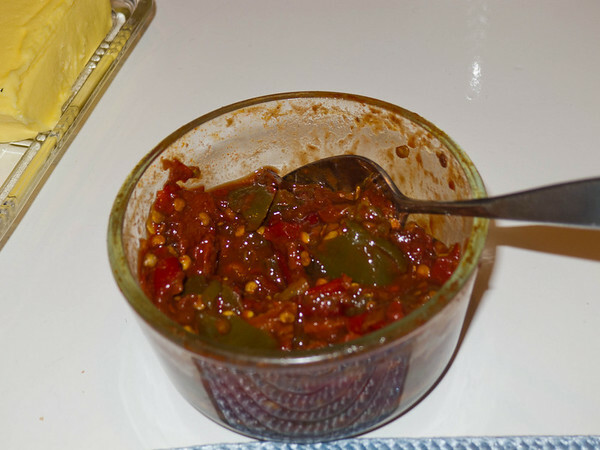 A blend of various chilies, in case the above is just too sweet and mild. 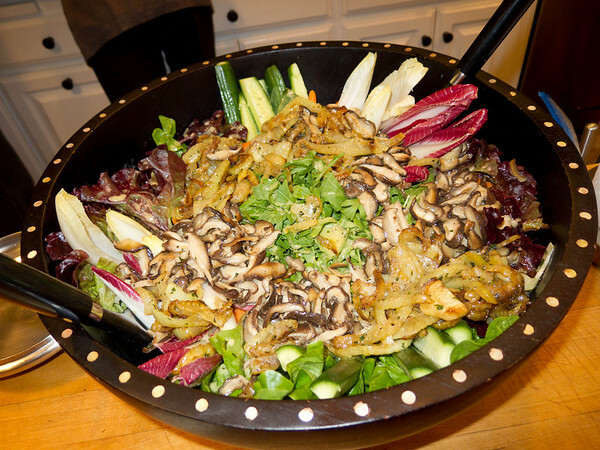 This was an amazing salad. It had a bit of everything in it, and was delicious. Two homemade deserts. The hostess makes the most incredible deserts. 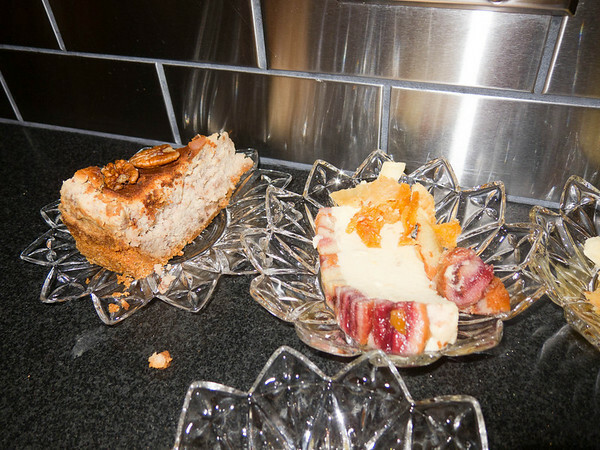 On the left is a praline cheesecake, and on the right is a bavarian cream tart. 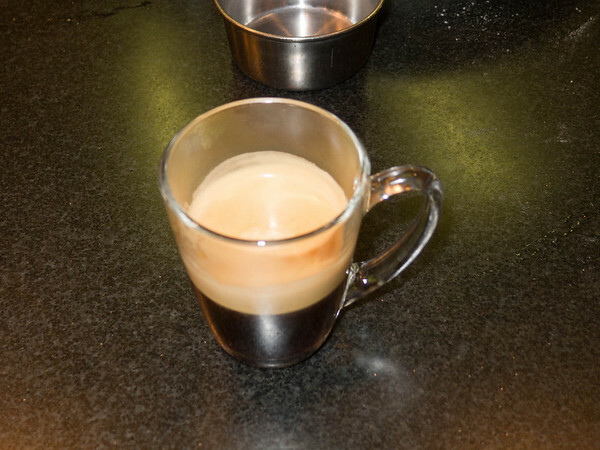 All that needed an expresso. 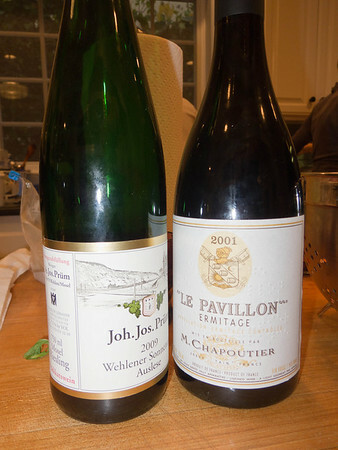 This entry was posted in Food and tagged Apicius, celebration, Chanukah, Cooking, Dessert, Food, Hanukkah, holiday, Home, latkes, party, Potato, Potato pancake, Riesling, Salad, side dishes, vegetarian, Wine, Wine tasting descriptors. They aren’t really a solo food 🙂 I liked the cheese ones best myself. Andy, wonderful review. I want to follow your food and wine writing, so I am subscribing. Great! Glad you enjoyed — we certainly enjoyed the event! Feel free to pass around the blog too.